OK, all the scary bits aren't done. I asked Bruce at Arch not to fit the scuttle, because I wanted to mount it using rivnuts and bolts rather than rivets, for easy access. 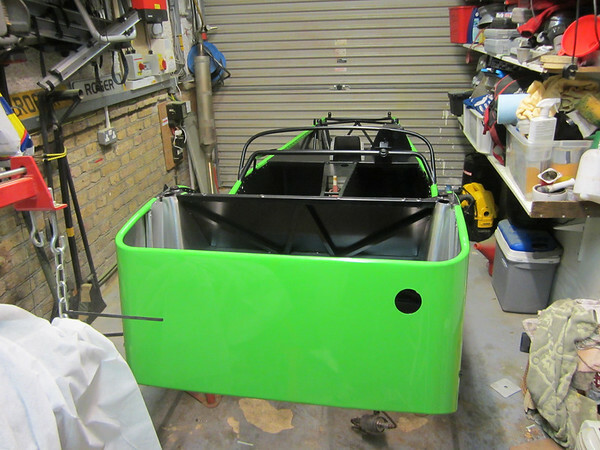 Unfortunately, the scuttle came rivetted to the bulkhead, just not fitted to the car (the bulkhead needs to stay in place because that has lots of electrical gubbins attached). So I had to drill out all Arch's nice rivets and replace them with many fewer rivnuts, and cover the remaining holes with aluminium tape. A scary business, but nothing went seriously wrong (though I did manage to scuff the bulkhead by resting it on some swarf while drilling). 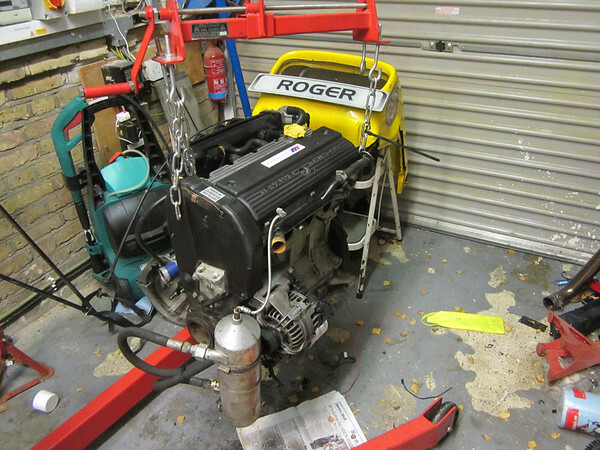 Next job was mounting the ECU, which means drilling holes in whatever you call the flat-bit-in-front-of-the-scuttle. I hate drilling stuff because you just KNOW you'll get it wrong and have to drill new holes and somehow fill the old. After a near disaster where my first planned hole turned out to be directly over a chassis tube, I think I've done it OK. Probably find the bonnet won't fit now, or something. Fitted rivnuts again, rather than having to screw nuts onto the bolts that hold the ECU in place, and order new caphead bolts off ebay because the M5 x 60 screws have got really manked-up heads. Still putting off any big bits like fitting the de dion tube or front suspension. Will get there eventually. At the moment it seems like I've got loads of time, but I've got a nasty feeling that the new race season is going to creep up on me faster than expected. Made good progress today by the clever technique of inviting my brother round and letting him get on with it. We now have the scary bits done - wiring harness in place, brake lines all routed and fuel lines where they're supposed to be. Simple matter of assembly from here on in. I'm being really careful to make sure nothing goes back on without being inspected, cleaned, refurbished as necessary or replaced, and it's paying dividends. My clutch has been heavy for a long time - so long that I'd rather forgotten it wasn't always like that. But now I've discovered the plastic surround on the cable inner was split, and binding on the outer, and the pedal bush was seized. A new cable and refreshed bushes and it should be hugely improved. Lots of other little issues are turning up as well. The car is eight years old now, and it's probably well overdue for a complete strip and refit. Somehow I've managed to lose half the boot floor. God knows how - it's a big chunk of wood and aluminium but I've searched the garage, the car port and the front garden, and it's nowhere to be seen. 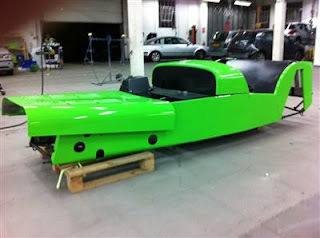 Shall have to order another one from Caterham - that's an extra £20, but not a lot in the wider scheme of things. I'm not counting, but I wouldn't be surprised if I'm the wrong side of five grand already. Never mind, it's going to be a vastly improved car when I've finished, so it feels worth the cost. Not bad at all. I'm not keen on Anglesey, but everyone else likes it so maybe it'll grow on me. Cadwell's a great circuit to drive, but hard to race on because it's so difficult to overtake. Just have to qualify on pole, I guess. Best news is that it doesn't clash with Cropredy festival (the kids' favourite event of the year) or Oracle OpenWorld (my employer's favourite event of the year). Sounds simple enough, doesn't it? What could possibly go wrong? Trouble is my garage is a right mess with all the painting. 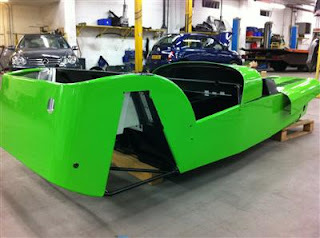 Need to get it finished (one more wing to go) and clear up ready to move the chassis in. Then I can start breaking things in earnest. I do like that green. It'll have a black band round the front when I'm done. 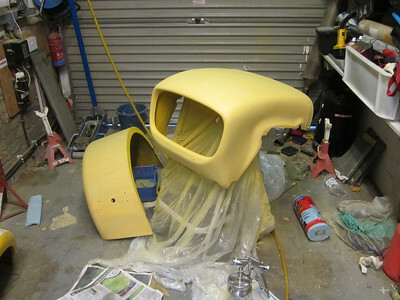 This was the first coat - the new spraygun is SO much better than the old one. But I still managed a get a run in it - just trying to put it on a little too thick. That will sand down, but the next coat is the final layer, so can't afford any runs in that. One wing is finished. I was going to buy another wing since my right hand one was pretty knackered. But I found an old green one which had been drilled for wing protectors and a reversing light at the back - and had a couple of cracks. Repaired the cracks with fibreglass, filled all the holes, and soon it'll be ready to paint. Note to self: must tidy workbench. Had an interesting time with the compressor on Sunday. Compressors draw moisture out of the air, and you're supposed to drain them - probably daily. I've never drained mine. Ever - like in around twelve years. I did try, but taking the drain plug out didn't do anything - presumably the drain hole was blocked. So this time I shoved a pointed metal rod up there. REALLY should have done that in the garden, not the garage. And/or should have bled the air off first. There was a small explosion and several pints of brown, muddy water exploded out the bottom of the compressor - covering me and everything in the vicinity and leaving a large pool of the same all over the floor. Ah well, at least I won't need to buy a new compressor. My friend "Bish" at Russell-Parry is painting the car for me, but I decided to do the nosecone and wings myself (nosecone to match the car, black wings). Which meant digging out my old Bodger's Guide to Painting from my bike racing days. Ah, yes, I'd forgotten a lot. Not least the mess that spraying makes of everything in the garage. Everything now has a fine sheen of beige filler-primer paint dust over it. It's a long time since I last painted anything - 2002, I believe. So all my stuff was nearly 10 years old. The paint was thick and gloopy, the spray guns long jammed. So off to the Car Paint Company in Hayes to buy a box full of paint, primer, thinners, tack cloths, etc, and a new spray gun. Nearly £130 later, I wondered if it might have been cheaper (and a damn site easier) just to get Bish to do those bits as well. Ah well, now I have the wherewithall to paint any parts that might need touching up after any track-based incidents in future. Well, it's been a while. Google changed the way Blogger worked a long time back, and I never got around to migrating my blog to the new system. But now I have, and it's time to log the rebuild of my car. Why a rebuild? Back a few months to Pembrey - my last race for 2011. It's Friday testing, and I'm just happily making my around the hairpin. Suddenly there's an almighty bang, as Gareth Cordey drives into the side of my car at around 70 mph. Turns out later his brakes had failed. It was an enormous impact. 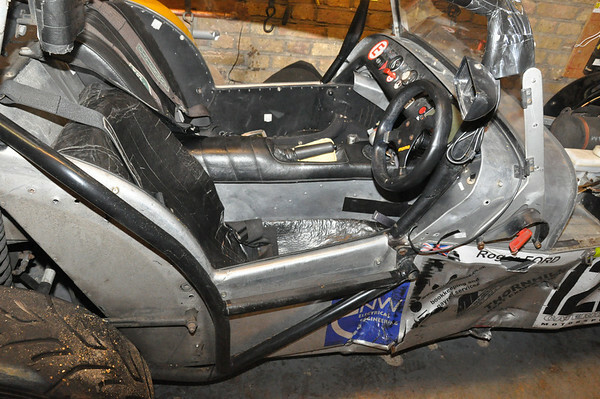 The side of my car was crushed - fortunately most of the energy being absorbed by the side-impact bar and the roll cage. The cockpit was somewhat narrowed, and it was tricky to get out, but I was completely unhurt. 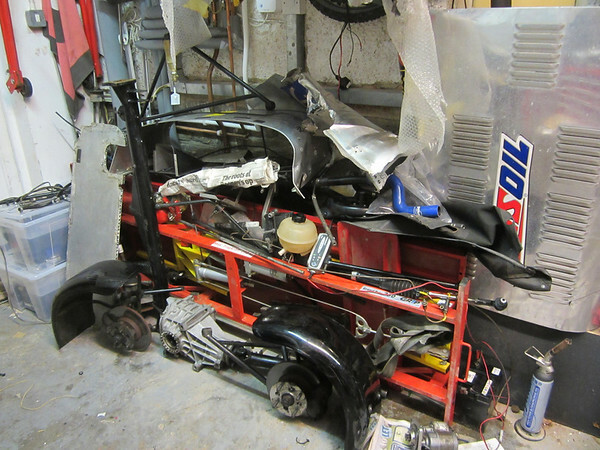 Gareth's car was even worse, the whole front end was completely trashed. 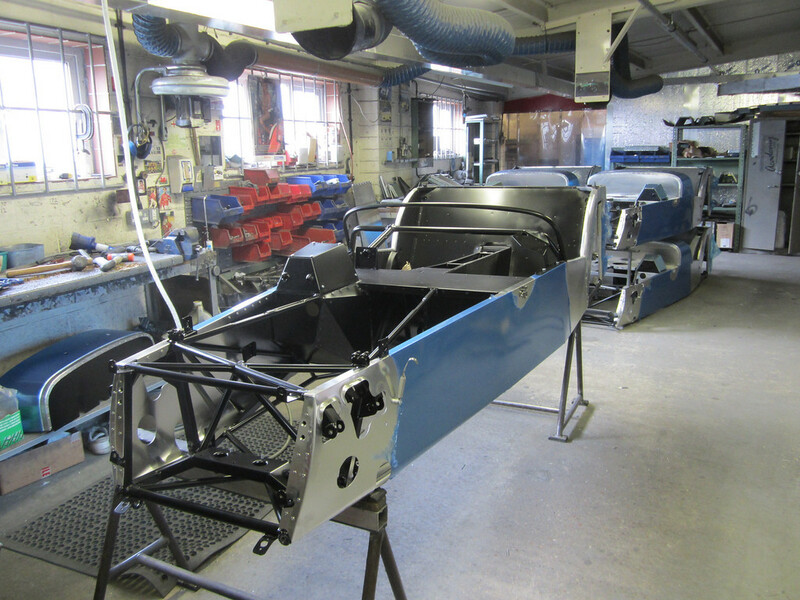 Given the location of the damage, there wasn't much chance of fixing it "in place", so it meant a complete strip-down and then shipping the bare chassis off to Arch Motor (who produce the chassis for Caterham) for a full rebuild. After a few weeks at Arch, I went to pick it up. It's looking very spangly and new! When I originally got the car, I decided not to paint it. 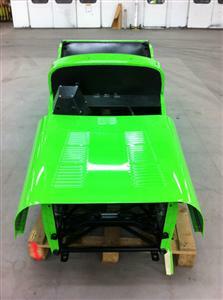 Caterham were asking the best part of a grand for a full paint job. In the past I've sometimes regretted this - the bare aluminium is hard to keep looking good. So this time, I've had various inside parts powder coated, and I'll be having the outside painted "Kawasaki Green" - a nod to my earliest days of bike racing, when I started on a Kawasaki KR-1S.